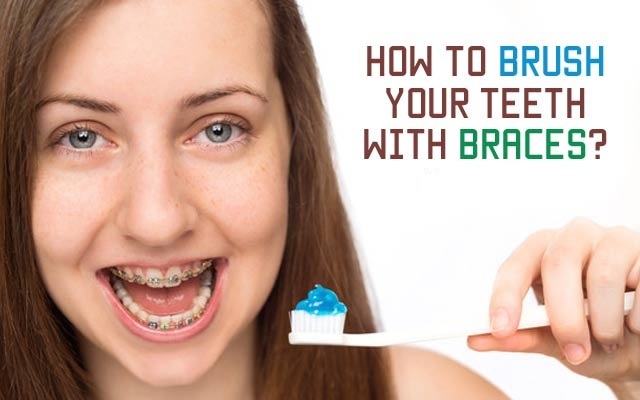 Dental Care | Health Articles | How to Brush Your Teeth with Braces? Individuals with braces often face a top challenge, and that is brushing. Braces need that extra effort to clean teeth and different angular movements to reach where germs and food buildup, particularly around bands, brace brackets, fixed retainers, and wires. But by considering our expert tips, you can easily learn the perfect ways to brush your teeth with braces! The first vital step in brushing with braces is to select a soft toothbrush that is strong enough to clean those metal brackets, but still gentle on the gums. There are varieties of toothbrushes available in the market that is specially designed for this purpose. These brushes placed bristles at an angle and designed to sweep germs as well as food particles from tricky areas that are difficult to reach. Once you have selected the perfect toothbrush, the next step is to select toothpaste that can clean your teeth and braces as well as offer them absolute protection. Most of the toothpaste is perfect to use with braces, but make sure you don’t use teeth whitening toothpaste or products. It is because these products can damage your braces. Good toothpaste is one that cuts through the food into small particles and easily cleans teeth without damaging the braces. At the same time, the toothpaste must effectively kill germs and combat plaque from forming around braces and teeth. Hence, make sure you select toothpaste that is an all-around cleaner. With a selection of appropriate toothpaste and toothbrush, it is vital to learn how to brush effectively with braces. You must begin brushing from one corner of the mouth and placing the bristles of brush at an angle of 45-degree against the back teeth. This will make the bristles move along the gums and brush forth and back on all areas of gum line on lower and upper teeth. After this, move your hand in small circular motions. Gently sweep the toothbrush cleaning for one or two teeth at a time for at least 15 circles. It is always wise to select a specific pattern that cleans the sides of the face including tongue sides and brackets of braces. The biting areas of the lower and upper teeth must be brushed with forth and back motion. Once you have finished brushing the teeth, make sure that you clean hard to reach regions such as face side of lower and upper front teeth, under lips, and other areas where wires and brackets are located. This is vital to make sure that all food and plaque is removed from the mouth. The entire process must take 4-5 minutes to clean the braces and teeth thoroughly. Take an 18-24 inches dental floss to carry flossing. You must wrap the floss ends around the middle and index finger and then move in the correct direction. Make sure you hold the floss tightly around each tooth and move the floss forth and back in a pull-push motion and down and up against the side of each tooth. It is suggested to brush your teeth at least 3 times a day if you have braces. Even most of the people brush their teeth after every meal and before sleeping so that there is no food or germs left inside the mouth. It is because germs left inside the mouth can cause significant damage. Also, it is suggested for everyone to change their toothbrush most often. But if you have teeth with metal, then your brush is moving on metal as well as enamel. For this reason, patients are encouraged to change their toothbrush every two months. Brushing is not the only solution to keep your braces and teeth clean. Flossing is also needed at regular intervals. Various rinses are recommended to keep your mouth clean and healthy. With putting in some extra time and efforts and using the right tools, brushing your teeth with braces will never be a big challenge. Sure, this would be great fun! Biography: I am a specialist dentist in prosthetic dentistry and dental implants. I did my dental science studies from Sri Ramachandra University in Chennai and went on to do Advanced Implantology Training in Japan. Having years of experience in implant-related prosthetics and dental implants I have also addressed numerous seminars about implantology in India. My articles are published in some of the leading international dental science journals. I am a proud member of IPS ISOI DCI and fellow of ICOI in the US. I have had the most distinct dental practice experiences with Aesthetica Dental Clinic Kolkata and A.P. Superspeciality Dental Hospitals Hyderabad that have their marked presence in the dentistry practice. All the years of my experience as a dentist I noticed how people are even scared of visiting a dental practitioner. There is fear anxiety uneasiness and mistrust! I could not appreciate that as a doctor that my patients are fearful of consulting and taking proper treatments for their dental worries. Establishing ‘THE TOOTH COMPANY' was a vision that is driven out of a passion for making a difference in the dental services arena in India. My philosophy is to take out the fear and anxiety out of the dentistry and provide the best-in-class treatments to my patients. We use cutting-edge technology to make our dental procedures painless and fearless. The Tooth Company is equipped with advanced diagnostic and treatment devices with 100% safe radiation-proofed clinic. It is safe for pregnant women too. We have designed our ambience in such a way as to make the nervous patients calm and confident about the treatment. We follow 12 step sequenced process of sterilisation and adhere to international safety and hygiene standards. The monitor fitted customised dental chairs from Brazil are used to provide engaging audio-visual entertainment to the patients while the treatment is provided meticulously. The high precision dental devices are imported from Germany Japan and the US. The dental merchandises that we use in our clinic come from industry renowned companies like 3M Dentsply Septodont etc. Our clinic is done on minimalist design principle complemented with ultrasonic fragrance diffusers NASA-approved indoor plants to regulate oxygen level in the clinic. The entire clinic is done to provide a soothing and positive experience for the patients. I have some of the best specialist dentists in the team who are incredibly skilled and responsive. They understand the concerns of the patient and offer detailed consultation to make the patients comfortable and confident. I am extremely proud to say" The Tooth Company is truly a multi-speciality dental centre". We are a modern dental care centre offering honest clean and 100% safe dental experience. • How to Brush Your Teeth with Braces?